So I published a post a few days ago - you may have seen it - about the time I nursed my 4 year old on a flight. Needless to say, it brought out the haters. Even though my site is literally peppered with references to international health guidelines about breastfeeding, which all state very clearly that breastfeeding up to - and beyond - two years of age is the ideal...it seems that rather a sizeable chunk of people really are still very confused. You might think, well sure - these people aren't exactly well versed in healthcare protocol or WHO directives! Of course they don't know the recommendations! Yet it's easy to assume, at the very least, that they have the brain cells to separate breastfeeding from drinking/eating in general, no? For instance, when we see a child having a drink of water, we don't automatically assume that the child receives no other food or drink throughout the day, right? And if we see a child enjoying a sandwich, we don't jump to the conclusion that the poor little thing isn't offered any other form of nutrition at all, do we? So why - why - do people assume that babies, toddlers and children who are breastfed receive no other food or drink? Nil. Zip. Diddly squat. On what planet does that make even an ounce of sense? "Too old! Time for a sippy cup, please!! My child was eating solids and drinking cow's milk well before 4 years old! " Dude - my kid is well over sippy cups, you know...being 4 and all. Do these people really think that a breastfed 4 year old has lived on breast milk alone for 4 whole years? Breast milk is utterly amazing, but magical pixie juice it is not. It is so easy to get lost in the comments of these pieces that seem to touch upon the last nerve of every Trump supporter in America. But really, there are so many people who understand. Who smile and nod. Who look at their own breastfed child of 1, 2, 3, 4, 5 and think - yes...me too! Because - sorry haters - we are many. "The haters have only seen newborns breastfeeding, so they assume that's how it works all the time." Breastfeeding has literally become a lost art. A hushed taboo reserved for the newest of souls and superseded by shiny packaged cow's milk in barely any time at all. Since when is human milk for human children seen as anything other than totally normal? According to the World Health Organization, 36% of infants aged 0 to 6 months are exclusively breastfed. This means that a whopping 64% are not. The majority of children are not "optimally breastfed". It is barely any wonder that so many people have no idea at all as to what a normal and healthy nursing relationship looks like. Add to that, the fact that 71% of moms surveyed by Lansinoh felt a 2 year old would be "too old to breastfeed", it is really no surprise that people can't disassociate the mighty sippy cup from the lowly breast. Which is why I'm writing this right now. And it's why my Facebook page exists, full of thriving breastfed children and proud, strong mothers. It's through sharing our stories and prioritising facts above misguided opinions that we encourage and empower other moms to nurse their babies, according to international health guidelines and human biological needs. Nurse on, mamas, nurse on. Thank you to mama Sam for allowing me to feature her picture in this piece. 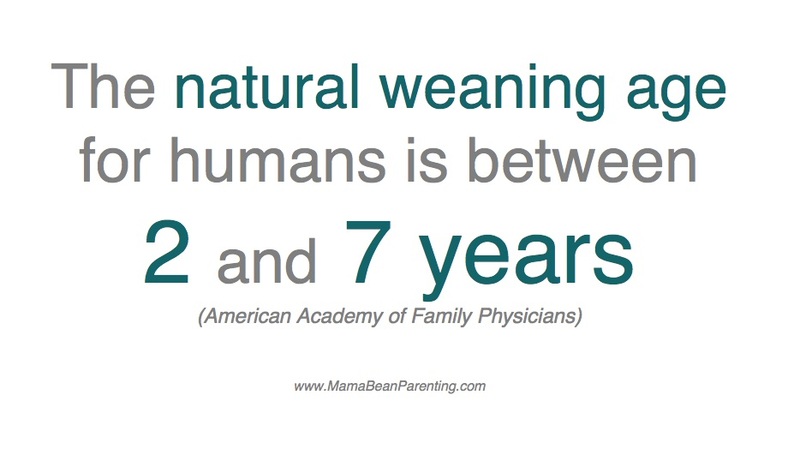 For more photos in celebration of breastfeeding and motherhood, join the Mama Bean village on Facebook! It's so good that the WHO and AAFP recommend full-term nursing. 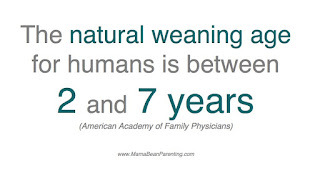 When my sons turned 2, they were nowhere near ready to wean. I nursed my oldest for 3 1/2 years, and my second is 4 1/2 and still nurses most mornings when he wakes up. It's so good to hear all this. These are "my people". It's good to be among like-minded people who know that extended breastfeeding is a wonderful thing.